Welcome To Yorkshire insist their bid to host the start of the Vuelta a Espana is unaffected by Sir Gary Verity’s resignation as chief executive. Verity, the man credited with bringing the Grand Depart of the 2014 Tour de France to the region, resigned last Friday citing ill health. His departure followed an investigation into his expenses and concerns over his behaviour towards staff. Verity’s exit came less than six weeks before the fifth edition of the Tour de Yorkshire, a legacy event of the Tour de France, and six months before the region will host the UCI Road Cycling World Championships. 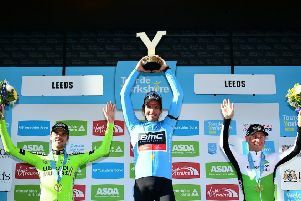 Cycling had been a major focus for Welcome To Yorkshire under Verity, and commercial director Peter Dodd – who has taken on Verity’s responsibilities – insisted that would not change as they target Spain’s Grand Tour, La Vuelta, and a return of the Tour de France. “We’ve still got our ambitions,” said Dodd. “Like Gary and I used to say, it’s still a case of when, not if, the Tour de France returns. The Vuelta team will be here at this year’s Tour de Yorkshire to take a look at it so that’s still part of our plan to get the Vuelta to start here. That has not changed. In December, Verity indicated the Vuelta could visit Yorkshire as early as 2021, though Dodd said it was still too soon to set a date. In a statement on Friday, Welcome To Yorkshire said Verity had agreed to “voluntarily reimburse Welcome To Yorkshire for monies owed” following an investigation. In his own statement, the 54-year-old apologised for times when his performance and leadership may have “fallen short”. Dodd acknowledged that Verity had made “errors of judgement” but said he was “not well” and is now receiving help. Both the Tour de France and La Vuelta are operated by the Amaury Sports Organisation (ASO), which also organises the Tour de Yorkshire. Verity had built a close friendship with Tour de France director Christian Prudhomme, but Dodd said the relationship between the two organisations runs much deeper. Asked about his conversations with ASO in recent days, he said: “Everybody is the same. The first priority is Gary’s health. Then it is onwards and upwards.